The band that put Rockabilly on the map in the 80’s, Stray Cats, made a triumphant return to Orange County playing their first show here in 10 years on Thursday night August 16 for the first of a two-night stand at The Pacific Amphitheater in Costa Mesa. Oddly enough the last time the Stray Cats played the OC was at the same venue back in July of 2008. Having played only two shows as The Stray Cats in the last 9 years, the anticipation was high for this one as shown by the near capacity crowd on a beautiful summer evening with a cool breeze. Opening the show and playing a highly entertaining set full of good vibes and smiles was Cherry Poppin’ Daddies. Although their music is a bit more swing/ska based – they were a perfect fit for the opening slot. Vocalist Steve Perry (no – not the Steve Perry from Journey) led the band through 40 minutes of fun with lots of animated dancing along with killer sounds from the two saxophone, two trumpet horn section. The band left the crowd fully pumped and ready for the Stray Cats to take the stage. About 8:30pm the lights dimmed and the Stray Cats hit the stage and opened the show with “Runaway Boys” of their 1981 self-titled album. Immediately there was no one left sitting as all in attendance were on their feet dancing and singing with the band. The first thing you notice is the sound . . . the band sounded amazing and some could argue better than ever – the veteran trio was spot on. 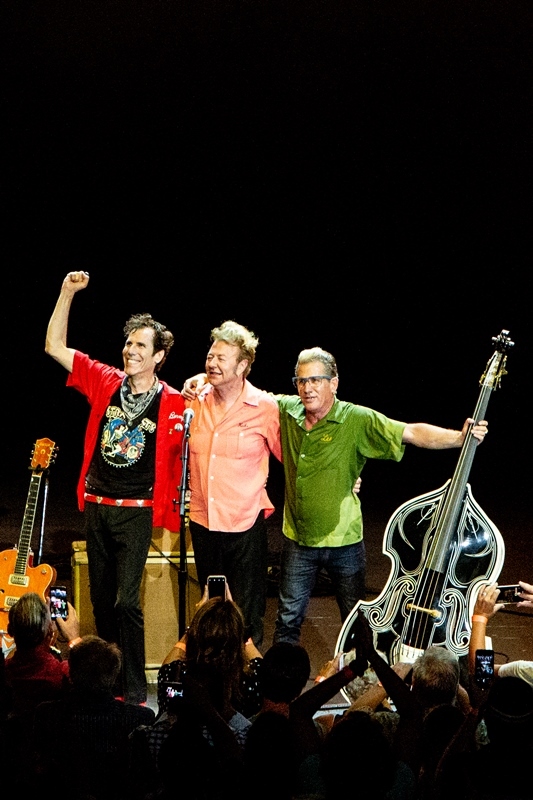 Vocalist and guitarist Brian Setzer’s voice was as strong, crisp and twangy as you would expect while bassist Lee Rocker was slapping that bass like a madman all night long as Slim Jim Phantom anchored the band with his stand-up drumming. 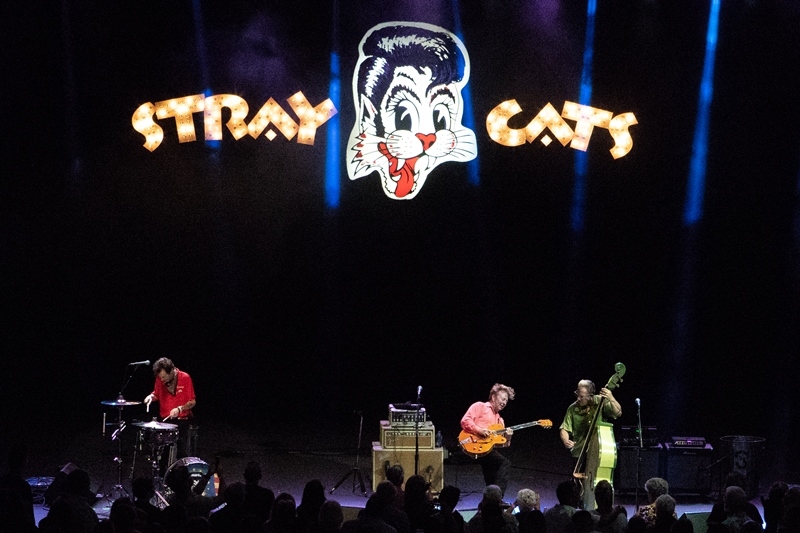 The second thing you notice is the stage setup – very barebones – a few amps, a couple garbage cans to help set the mood and a large Stray Cats logo as a backdrop, these cats (no pun intended) are just focused on the music. Setzer barely spoke in between songs but after the fan favorite “Stray Cat Strut” he stated “It’s been a long time, How ya been? You cats out here always did dig the Rockabilly sound” and then went into “Double Talkin Baby”. It was obvious the band was on good terms as the onstage comradery was in full effect with band member hugs, high fives and smiles throughout the night. In addition to his spot-on vocals, Setzer is no slouch on guitar as he rips out some twangy sounds on his Gretsch and even did a few Chuck Berry style duckwalks across the stage. Lee Rocker is a beast handling that large standup bass throughout the show. At times he actually held the bass totally horizontal and even put the bass on the ground and layed on it while playing in addition to his trademark standing on the bass while playing – incredible stage presence. Then there is Slim Jim Phantom who has a very basic drum setup and plays standing up. Like Rocker, Phantom is a very dynamic playing who at times stands on his bass drum and also runs around the stage in between songs. Rocker took lead vocals on “My Baby Left Me” as well as “Bring it Back Again” and sounded fantastic. About an hour into the show Setzer again addressed the crowd “How’s the set?” You all like it?, I’ll admit I’m a little rusty” and then blasted into “Lust n Love”. To end the main set, Setzer stated – OC you’ve waited this long . . . you ready to rock this town and the Stray Cats played one of their biggest hits of the same name “Rock This Town”. The band left the stage then returned about 3 minutes later for a two-song encore. Stray Cats ended the night with “Rumble in Brighton” and “Somethin’ Else”. Setzer, Phantom and Rocker took center stage in arms and gave a bow and a thank you . . . night one was an overwhelmingly obvious success and no-doubt many fans in attendance will return for night two on Friday August 17. 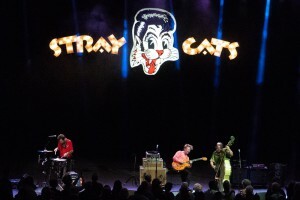 The Stray Cats easily and successfully were able to re-capture the energy, aura and magic that Brian Setzer, Lee Rocker and Slim Jim Phantom collaboratively create as the Stray Cats. The Rockabilly community and the music world in general can only hope for a real Stray Cats tour in the near future.